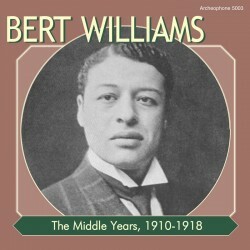 The second volume of The Complete Bert Williams. 26 songs from 1910-1918, recorded in New York, including two monologues that were held for release until after Bert's death: "How? Fried" and "You Can't Do Nothing Till Martin Gets Here." 24-page booklet with rare graphics, and notes co-written by Allen G. Debus. Also features the entire article "The Comic Side of Trouble," by Bert Williams, published in 1918 by the American Magazine. Visit The Middle Years' expanded catalogue page to see the complete track listing, read an extended description, and listen to sound samples.